Thirty-four water samples were collected all along the course of River Yautepec, Morelos State, Central Mexico, in three different zones based on the physical and anthropogenic setting. In situ measurements of physical characteristics (temperature, pH, conductivity, and turbidity) were also performed at each sampling station. Likewise, total/dissolved metal concentrations (Fe, Mn, Cr, Cu, Ni, Pb, Zn, Cd, As, and Pb) were determined using an atomic absorption spectrophotometer. Located in a peri-urban and volcanic zone of Central Mexico, the river system presented impacts of both natural and anthropogenic activities. Results revealed differences in pH values (6.7–8.23) in all the three zones probably due to the influences of volcanic ash and local geological formations, whereas conductivity levels (635–1098 μs/cm) were high indicating the effect of agricultural and industrial activities. The relative order of the concentrations of metals in both the total and dissolved fractions was observed to be in the following order: zone I, Fe > Zn > Mn > Cu > Pb > Ni > Cr > As > Cd > Hg; zone II, Fe > Zn > Pb > Ni > Mn > Cu > Cr > Cd > As > Hg; zone III, Fe > Pb > Zn > Mn > Ni > Cu > As > Cd > Cr > Hg. Calculated heavy metal evaluation index (HEI) values indicated less contamination. However, concentrations of Fe and Pb were observed to be higher than the permissible limits set forth by the Mexican government for human consumption. 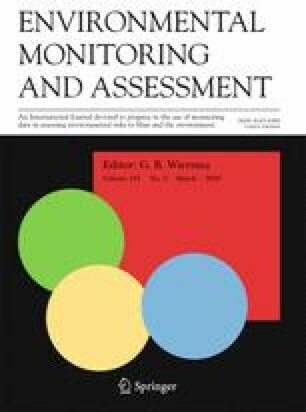 Henceforth, the prerequisite for maintaining and improving the health of a river system depends on continuous long-term monitoring of the dynamic ecosystem for sustainable management. FRG wishes to thank the financial support through the projects SIP-IPN No. 20170470 and 20180759 by the Secretaria de Investigación y Posgrado of Instituto Politécnico Nacional (IPN), Ciudad de Mexico. FRG, MPJ, and SBS thank the Sistema Nacional de Investigadores (SNI), CONACyT. FRG and MPJ thank COFAA & EDI of IPN, México. This article is the 98th contribution (partial) from the members (SBS & MPJ) of the Earth System Science Group (ESSG), Chennai, India. CONAGUA (Comisión Nacional del Agua). (2015). Actualización de la disponibilidad media anual del agua en el acuífero Cuautla-Yautepec (1702), Estado de Morelos. CONAGUA Publishing Web. https://www.gob.mx/cms/uploads/attachment/file/103146/DR_1702.pdf.